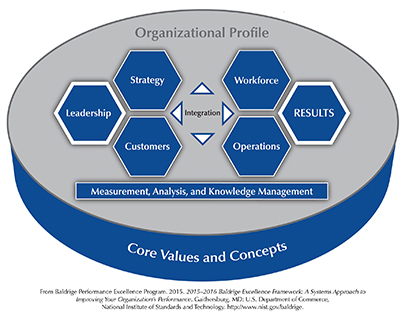 As the following diagram of the Baldrige framework indicates, the basis of the Baldrige Criteria for Performance Excellence is a set of core values and concepts that are embedded in high- performing organizations. These core values and concepts (listed below) are the foundation for integrating key operational requirements within a results-oriented framework that creates a basis for action. Under the auspices of the Baldrige foundation, a set of leadership behaviors has been developed to reinforce these core values in high-performing organizations. They are behaviors that typify role-model leaders and can form the basis for leadership development and senior leadership team design. Senior leaders should build their own strength in these behaviors and also make sure that their leadership team embodies strengths that they do not personally possess with sufficient strength. The leadership behaviors are aligned with the 11 Baldrige core values and concepts, respectively. While all of the behaviors are important, it is critical that senior leaders possess and personally exhibit the executive behaviors associated with visionary leadership, systems perspective, ethics and transparency, and delivering value and results. They are central to the role of an effective leader. These behaviors are embodied in the "bookends" (first two and last two) of the core values and concepts. For the past two years, the Baldrige Executive Fellows have been ranking these leadership behaviors, indicating those in which they possess strength and those in which they would most like or need to develop further ability. Interestingly, within the group of approximately 30 fellows there was significant agreement in the rankings. Their top two areas of strength were the behaviors associated with visionary leadership and valuing people. For the 2015 fellows, ethics and transparency was also among the top strengths. This core value was broken out from visionary leadership in 2015; thus the 2014 fellows did not see this core value on their list. In the area of needing to build greater competency, fellows in both cohort years included customer-focused excellence, systems perspective, managing for innovation, and organizational learning and agility. Of the four core values designated as essential behaviors for senior leaders, two were designated as strengths by the group (visionary leadership and ethics and transparency), one as an area for learning emphasis (systems perspective), and one was considered an adequate skill (delivering value and results). In five studies of 2015 CEO challenges and opportunities, the one opportunity mentioned in all five studies was the need to build stronger customer relationships. This need ties directly to the Baldrige fellows' perceived need to build greater competency in customer-focused excellence. They apparently share a common need with the thousands of senior executives in the five studies. This need for senior executives is based on several factors: customers setting higher expectations, customers wanting customization in offerings, and the greater availability of data and analytics that can be used in understanding individual and aggregated customers. The five studies also emphasized senior executives' opportunities in the areas of ethics and creativity, closely tied to core values the Baldrige fellows identified as a strength (ethics and transparency) and as a need (managing for innovation and organizational learning and agility). In 2010, Joe Folkman published a study of the top nine leadership behaviors that drive employee commitment. The study gathered data from nearly 10,000 direct reports. Folkman focused on leadership behaviors that drove employee commitment because leadership effectiveness increased productivity and profitability even in difficult times. Seven of the nine behaviors identified were embodied in the leadership behaviors associated with visionary leadership, valuing people, and ethics and transparency. The overlap in this study with the data already presented gives a broader sense of the importance of these specific behaviors. Innovation is inherent in a learning organization. As indicated above, recent Baldrige fellows have recognized the importance of learning and innovation to the future success of their organizations and have seen these areas as current challenges for them. There have been numerous studies on the positive relationship between organizational learning and innovation, as well as the impact on organizational performance (see, for example, this study in the Journal of Business Research). While the behaviors associated with all 11 Baldrige core values are important, these studies give particular focus to the need for leadership strengths in the areas of setting vision, ethics and transparency, a systems perspective on their organization, delivering organizational value and results, organizational innovation and learning, valuing people, and building customer relationships. Look at your leadership behavior strengths and opportunities relative to the 11 Baldrige core values and concepts. Pay particular attention to the three core values that Baldrige fellows have indicated as personal strengths and that Folkman says are important: visionary leadership, valuing people, and ethics and transparency. Evaluate your opportunity to enhance customer-focused excellence, an opportunity for Baldrige fellows and a key opportunity for senior executives broadly. Look at the behaviors associated with the two remaining Baldrige core values designated as essential behaviors: systems perspective and delivering value and results. Evaluate your behaviors that encourage organizational learning and agility and managing for innovation. They almost certainly affect the future success of your organization. Set your personal learning agenda based on enhancing your strengths and addressing key opportunities. You and your organization will benefit!